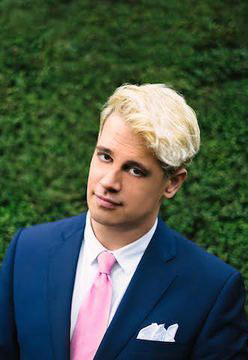 If you don’t already know of the provocative, homosexual Jew-turned-Catholic Milo Yiannopoulos—commonly referred to simply as Milo—you should check him out, and if you haven’t read his recent co-authored “An Establishment Conservative’s Guide to the Alt-Right ” on the (relatively) mainstream conservative website Breitbart, you should do so before continuing. Despite its title, Milo’s profile of the Alt-Right is aimed at an anti-GOP establishment conservative audience (i.e. Breitbart readers, Trump supporters—those ripe for defection to the Alt-Right). For the critical reader, it is effectively a thinly veiled attempt to promote the Alt-Right. It is conspicuously framed in a way that convinces “normies” that the Alt-Right is not as scary as it seems, makes some good points, and is fun, funny, young, rebellious, and cool. The inevitable result of this is readers who don’t agree with us yet will start consuming our content; effectively desensitizing them to our taboo criticisms and getting them to enjoy and laugh with us at our irreverent memes. This often leads people along a path that eventually ends with them embracing our line of thinking. I should remind any objectors that this has been the trajectory of many Millennials on the Alt-Right today: they started out by simply finding our explicitly racial, anti-feminist, and un-PC memes funny (but not taking them seriously), and as time and engagement with our memes progressed, they started seeing the legitimacy of our points and eventually embraced our ideas. This is not just some plausible theory. Anyone meeting and speaking to young people on the Alt-Right, myself included, can attest to this fact. So after I first read Milo’s aforementioned profile of the Alt-Right, I was excited and enthusiastic to discuss it with my compatriots—and to send it to those I’m in the process of “red-pilling” (which I did with great success, I might add). Although most of my respected friends and contacts shared my opinions on it, I was disappointed and surprised (though perhaps I shouldn’t have been) to see a lot of irrational criticism from people identifying as Alt-Right and others from the racially conscious community (many of whom are on the White Nationalist fringe which RamZPaul calls the “14/88ers”, some of whom notably reject the Alt-Right as too soft on race, homosexuality, Jews and so on). I find this apparent division on the topic in our community to be disconcerting, so I feel compelled to address the two main unfounded criticisms of Milo’s piece. The first is that Milo is establishing himself as a leader of the Alt-Right, and this is proof the Alt-Right is being co-opted by Jews and homosexuals. There isn’t much to say about this criticism except that the idea that a gay Jew could ever be a leader of the Alt-Right is patently absurd. The Alt-Right is overwhelmingly aware of the Jewish Question and critical of Jewish influence and power. We are also pro-family, pro-natal, and uphold heterosexual norms. The Alt-Right is, by and large, critical of homosexuality, especially in its effeminate and flamboyant manifestations (like Milo) and even more so as a defining identity. So this criticism is unfounded and absurd, and such suggestions should be treated as such. Setting aside the idea that anti-Semitic caricatures are hilarious, Yiannopoulos’s defense of the alt-right is just obviously untrue. Anyone who has ever read alt-right material can testify to their deadly seriousness. These people write multi-thousand-word treatises spelling out their ideas and grievances with mainstream conservatism. Here Yiannopoulos essentially admits that the alt-right is chock-full of genuine racists, anti-Semites, sexists, etc. — but says it doesn’t matter because they’re tweaking the leftists. As argued before, his argument is conspicuously framed in such a way as to convince “normies” that the Alt-Right is not as scary as it seems. In other words, he’s contributing to the rightward shift in the Overton Window. This profile is clearly opening an explicit rightward pathway from more mainstream anti-conservative establishment gathering points like Breitbart to the Alternative Right. It should be stated in no uncertain terms that Milo is not one of us and never can be. So how are we supposed to treat a flamboyantly homosexual Jew like Milo, who is nevertheless contributing to our cause? I believe we should view and treat Milo as an “ally of color ,” so to speak—someone who is not one of us, but an ally of sorts by right of his net contributions to our movement outweighing the harm he may cause us. One might object here and question whether Milo has really contributed enough to warrant “ally of color” status, so allow me to qualify him. Whatever Milo Yiannopoulos’s true motivations or disagreements he may have with us—both of which I think are irrelevant, much like my attitude towards whatever Trump actually believes—he is someone in a unique position to get away with politically incorrect statements in the mainstream. As an overtly gay man of Jewish descent, his criticisms fly in the face of and weaken leftist narratives. It is a particularly infuriating thing for defenders of political correctness to deal with, since he is a financially and commercially successful entrepreneur with an impressive social media following and is the technology editor for a large conservative website. He is a relatively high profile individual and they can’t deal with him as they would normally deal with us. And Milo has done more than simply troll SJWs and co-author a single positive profile of the Alt-Right. He also wrote the Foreword to Vox Day ’s highly recommended and useful book, SJWs Always Lie , and regularly criticizes and attacks our enemies in flamboyant, scathing, attention-grabbing, and often hilarious ways on Twitter and in YouTube videos, TV interviews, podcasts, speeches, reports, and essays. Beyond the practical application of offering needy students the financial wherewithal to attend college, the grant will also heavily focus on the network created between prospective students and their mentors, and among students with other students. The founders of the grant plan to do advocacy work or release policy or research papers based on the results of the grant. Ironically, assuming the grant realizes its plans, I think it’s safe to assert that Milo Yiannopoulos has probably contributed more than many explicit, pro-White advocates. So yes, I think Milo more than qualifies as an ally of color. “Ally of color” status does not mean someone is beyond criticism. When an ally of color does something or produces content that aids our cause, we should encourage them, giving them the appropriate positive reinforcement. Likewise, if an ally of color does something or produces content that detracts from or harms our movement, we should criticize them, providing them with negative reinforcement proportionate to their transgression. Reinforcement should be employed intelligently, thoughtfully, and strategically, though. It’s important to strive for perspective and see the bigger picture. Donald Trump’s disavowal of David Duke and White Nationalism is a good example. Although Trump is not an “ally of color,” he can be treated in the same way for the purpose of this illustration. He might not be one of us politically, but he is still doing us a lot of good by attacking political correctness and voicing a number of ideas that help our cause. So should we provide Trump with negative reinforcement when he disavows David Duke, White Nationalism, and the like? No! Someone with perspective should be intelligent enough to realize that if he did not disavow us, it would cripple his ability to positively influence the political and cultural environment that has been pushing the Overton Window to and energizing the right. In short, Alternative Rightists (including the racially conscious community, Identitarians, and functional White Nationalists) need to take a more strategic approach to dealing with allies of color such as Milo Yiannopoulos. 1. Milo’s Wikipedia page . This explanation and profile of Milo  at Vox is also worth reading. 2. In case it is removed, Richard Spencer and Nathan Damigo’s podcast “Allies of Color” is mirrored here .